Our venerable and God-bearing Father John Cassian was a 4th/5th century monastic saint known for his writings on the monastic life and for correctives of the anti-Pelagian writings of St. Augustine of Hippo. His feast day in the Orthodox Church is February 29 (celebrated on February 28 in non-leap years), and it is also kept locally in Marseilles, France, on July 23. St. John was born in the Danube Delta in what is now Dobrogea, Romania, in about 360 (some sources instead place him as a native of Gaul). In 382 he entered a monastery in Bethlehem and after several years there was granted permission, along with his friend St. Germanus of Dobrogea, to visit the Desert Fathers in Egypt. They remained in Egypt until 399, except for a brief period when they returned to Bethlehem and were released from the monastery there. Upon leaving Egypt they went to Constantinople, where they met St. John Chrysostom, who ordained St. John Cassian as a deacon. He had to leave Constantinople in 403 when Chrysostom was exiled, eventually settling close to Marseilles, where he was ordained priest and founded two monasteries, one for women and one for men. St. John's most famous works are the Institutes, which detail how to live the monastic life, and the Conferences, which provide details of conversations between John and Germanus and the Desert Fathers. He also warned against some of the excesses in St. Augustine of Hippo's theology whilst refraining from criticising him by name. For this reason he has sometimes been accused of Semi-Pelagianism by the Roman Catholic Church and some Protestant commentators. St. John died peacefully in 435. "I shall speak first about control of the stomach, the opposite to gluttony, and about how to fast and what and how much to eat. I shall say nothing on my own account, but only what I have received from the Holy Fathers. They have not given us only a single rule for fasting or a single standard and measure for eating, because not everyone has the same strength; age, illness or delicacy of body create differences. But they have given us all a single goal: to avoid over-eating and the filling of our bellies... A clear rule for self-control handed down by the Fathers is this: stop eating while still hungry and do not continue until you are satisfied." And from the desert fathers You learned the restraint of the passions. To this end through your prayers grant our flesh obedience to the spirit. Of all who in Christ praise your memory. 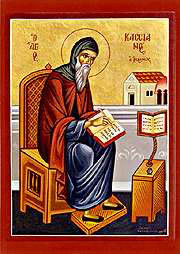 Therefore your spirit, venerable John Cassian, rejoices with the angels. Illumining ever the hearts of all who honor you. Who praise you with fervent love. This page was last edited on October 22, 2012, at 18:23. This page has been accessed 47,843 times.